As many of them thinks that WWW and Internet are refers to the similar things. But in actual manner both are different from each other. As I have wrote brief about the Internet on my last post, If you have not read the [Read here]. You all know what the Internet is. But do you know what the term INTRANET refers to? The Intranet is a smaller version of the Internet, which is limited to a company or organization, and provides an efficient and inexpensive way to distribute information and documents. The Internet is an open, public space, while an Intranet is designed to be a private space. Extranet is a private network that uses Internet technology and the public communication system to do business. If the Intranet services of a company can be accessed outside of the company, then it becomes an Extranet , meaning that it would have a gateway to and from the Internet. The WWW, or the World Wide Web is a huge collection of documents stored in computers around the world. These Millions of documents are known as web pages. A collection of documents run by one person or organization is called a website. A computer with one or more websites is known as a Host or Server. The WWW differs from the Internet in that the Internet refers to all the Interconnected national networks, while the World Wide Web is just one of these networks . 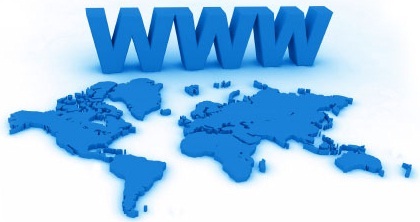 However, the WWW is so vast and widespread that it is often confused with being the same as the Internet.